July | 2006 | Vaguely Sauntering in a Geek Direction. “Good.” “Great.” “Love it.” etc. I cant help but wonder how normal I am, how normal my relationship with Kaye is, and how it could be that there could be any experience different from my own perception of reality. This may be an indication of deeper mental or psychological problems. And when I think about how others are, and when I begin to compare, I remember the promise I made myself a few months before I got married – just around engagement time. I will live my own life. I will not live in a certain way just because that’s how it’s done, but I will accept what is good and reject what is not. Life is good. I have a strange simultaneous weirdness going on – 1. It feels very natural and comfortable to be married. 2. It feels very strange and confusing at times trying to establish new “us” patterns. (those are the times when I say “What does everybody else do?” then remember that I’m not going to do it just because it’s what is “done”.) That’s probably about right. I hope. More to come as more comes. We moved into the new apartment, officially, got it all organized and filled our closet to the max with things that need to be donated or sold or something. 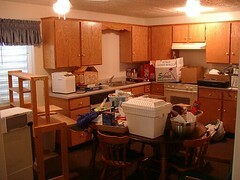 It’s a little frustrating that both Kayeleen and I have enough stuff for one apartment each. Got married in the St. George temple. Thunder boomed outside during the ceremony. We figure it’s some sort of stamp of approval. Now I’m not allowed to say “I” any more, I have to say “we.” Had a reception the next day in Enoch. We am now the proud owner of many towels. And a dance dance revolution pad… For which I am eternally grateful. Sunday was spent going to church and putting away things like oil lamps, clocks, decorative plates, and towels. Monday morning we left for Disneyland. 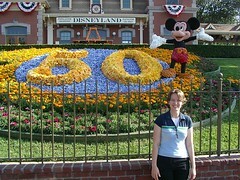 We spent all of Tuesday in Disneyland, then Wednesday in California adventure, then Thursday mostly in Disneyland. We saw the parades and the shows. There was a bluegrass show in the Golden Horseshoe that was pretty hilarious which climaxed in the lead ending up with a violin bow stuck up his left nostril while wearing fake buck-teeth. 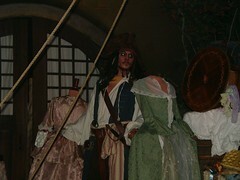 They added Captain Jack Sparrow to the Pirates of the Caribbean ride, which was cool, I suppose, but turned the ride into a story about Captain Jack rather than some hokey little ride through poorly done animatronics. We also then went and watched Pirates 2 in the theater in downtown Disney. I liked it a lot, but now we have to watch the first one again because we’re confused about a monkey. And some other things. They re-did the space mountain ride. It’s still the same coaster, but it’s been re-decorated and the music is back in the cars, and the special effects during the ride are a lot better than before. It was our second favorite ride. Our favorite ride was the Buzz Lightyear Space Blasters ride. You get to ride in a slow moving cart like the haunted mansion car, but equipped with blasters for each rider and a point display. You then slowly ride through sector z and blast the heck out of battery stealing robots and aliens. I got 599,400 points (nearly space commando level, I’ll have you know) the second time. Kayeleen got something like 49,000 points. Because we’re loving and caring, I don’t rub my massive scoring might in her face very much. We drove back Friday, exhausted, and discovered that the previously non-functioning ice machine in the refridgerator decided to go on some kind of ice making frenzy, filling 1/4 of our freezer with half-moon shaped ice chunks. (it then made no more ice until yesterday when it did it again.) Then off to Kanab for the open house on Saturday. It was pretty good, I thought. 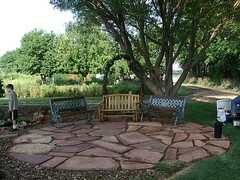 My parents have a nice yard, and Jodie had spent many hours doing landscaping and planting things and even making a little fishpond. We didn’t have many visitors, but it was really nice to be with family and close friends. Then back to the apartment Sunday night. We put away most of the stuff we brought back with us. Monday it was back to real life. But a slightly different real life. One where we’re married. I can’t count days any more. Down to hours now.I feel bad that I’ve neglected the site so much in the past few weeks. I’m afraid it really is my upcoming nuptuals that tend to distract me from producing much in the way of thought provoking, entertaining, and otherwise nourishing internet grub. But I’ve already started being responsible. My sister says that marriage is something that you can’t understand when you’re not in it, and if you really could you probably wouldn’t do it. I’m not sure how I feel about that idea. Come to think of it, I’m not sure how I feel about the end of my single life. Nor am I sure how I feel about my future. But I guess it’s better to feel fine than to feel bad. My feelings are beige. My future is a glazed donut as far as I can tell. Definately not bad – quite enjoyable really, but I’m not exactly drooling yet. But it could be that I find out there’s a lot of sprinkles on this future of mine that I haven’t seen yet. It may even be that what I’m failing to comprehend could be favorably compared to a Krispy Kreme factory, and I’m just noticing the free glazed donut they give you when you come in. Have I taken this metaphor too far? I guess the point is that I’m completely blank on the subject. No opinion, no preconceptions. I recognize there’s going to be a lot of work and emotional effort involved in whatever the future may bring. I’m in summer school, finished with one class and taking one online class. I hope to get two A’s out of it in order to prove to the pretty financial aid people that I’m deserving of government money. I don’t think I ever could have passed an internet class before my mission. It requires a level of self-motivation that I didn’t have before I let things be important to me. Like Kayeleen, or my future with her. Life is still good. The euphoria of engagement is pretty much gone for me, but I still feel just happy about life. Even when I’m at my frustrating and unsatisfying workplace. Sometime soon we need to work on getting a good base of writers for the site, but I don’t really know how to do that aside from just asking folk to do it. But why write here when you could write pretty much anywhere? Eh. I’ll figure it out after I get back to planet earth in a couple of weeks.